When you’re building the home of your dreams, you have the kitchen planned out to the last detail, the floors and the cabinets. The living room has the perfect accessories, the dining room the perfect table, and the bedrooms have the feeling of warmth and ease. All that time spent on the interior of the home, left the landscaping feeling a little bare. At Carr Homes, we want your luxury home, inside and out, to be the home of your dreams. Read through these tips to create a landscape that will add the finishing touches on your new construction home and create a beautiful and inviting landscape. Trees add character and depth to a home. Grown over time, tall, sturdy trees represent age and wisdom and will help your home feel like it was built decades ago. They can also add value to your home, as well as save you money. When trees are planted strategically around the home, the shade can offer savings on your energy bills. When deciding on trees to plant, be sure they are native trees and survive the cold winters of the area. Add shrubs, small trees and plants around the home, but again, make sure they’re native plants. When the plants have established themselves, native plants can continue to grow and thrive without much assistance. Having native plants in your new construction home landscaping can also save you money as opposed to nonnative plants, they will also add value to the home. Designing rain gardens with native plants will help with the property as well. When extreme weather occurs, rain gardens can filter and distribute runoff and prevent water from flooding basements. Outdoor lighting can make a home all the more inviting. 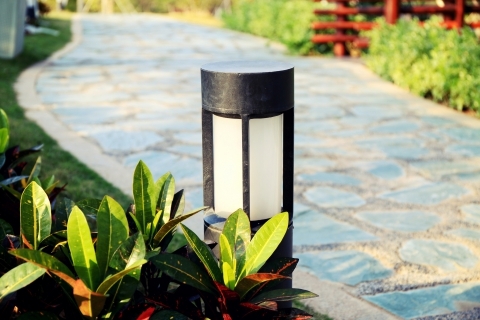 A lot can be done with outdoor lighting. Stylish lights along a walkway to the front entrance of the home can guide visitors inside. Soft lighting on a porch can create a friendly atmosphere. Lighting in the backyard, around a pool or scattered around the trees can give the yard a magical feel. Lighting doesn’t always have to be functional, like floodlights on the driveway; simple, decorative lighting can create a romantic environment. 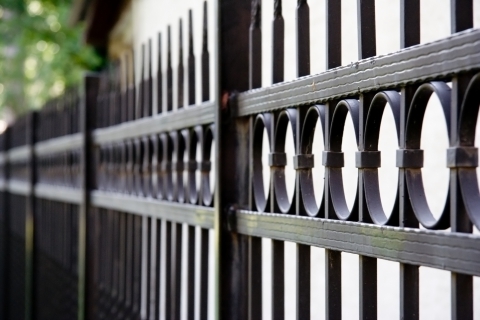 The white picket fence of the past has been modernized into impressive wrought iron fences, or thick, privacy fences. Pick a fence that will incorporate the home and the landscaping, and also is not too intimidating. Fencing can both be functional to keep pets inside, and can be used for privacy as well as add another layer of depth to your luxury home. When you’re designing a landscape for your luxury home, it can be simple and elegant at the same time. With a 6,000 sq. foot home built by home builders, Carr Homes, an understated landscape may be the way to go. Add a lot of green foliage and lighting along the walkways and your new construction home will have style on the interior, and the exterior will have an inviting landscape to match. Contact us today at Carr Homes to build the luxury home of your dreams.